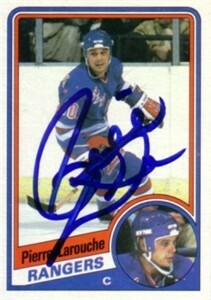 1984-85 Topps card autographed in blue marker by Pierre Larouche, who finished his NHL career with the New York Rangers. Card is in pristine NrMt-Mt or better condition. With certificate of authenticity from AutographsForSale.com. ONLY ONE AVAILABLE FOR SALE.